CANBERRA, Australia, May 6, 2013 (ENS) – Parts of Cape York Peninsula, one of the last wilderness areas on Earth, will be nominated as a UNESCO World Heritage Site by the Australian Government even as the Queensland Government develops a new bauxite mine there. The Gillard Government would like to submit a nomination for areas of Cape York Peninsula that have potential outstanding universal value and Traditional Owner consent in early 2013. The next session of the UNESCO World Heritage Committee will be held in Cambodia from June 16 to 27. Although Cape York land is mostly flat, about half is used for grazing cattle, and wildlife is threatened by introduced species and weeds, the large remote peninsula at the tip of the state of Queensland still has undisturbed wooded savannahs, tropical rainforests, spectacular coastal dune fields and natural rivers. Millions of hectares of Cape York are being returned to traditional owners through Aboriginal title and/or Indigenous Land Use Agreements, creating a mosaic of parks and reserves, protected areas, conservation-managed lands and rivers, and Aboriginal clan estates. Indigenous people own and manage roughly 25 percent of Cape York Peninsula and make up more than half the population of the region. Consultation with the Traditional Owners on nomination for World Heritage status has been underway since 2007 and is ongoing. A nomination to include areas of Cape York Peninsula on the World Heritage List will only go ahead with Traditional Owner consent, as community support is important for a successful nomination. A new report detailing the areas of Cape York Peninsula that may meet World Heritage criteria for outstanding universal value commissioned by the Gillard Government was released on April 26. Author Dr. Peter Valentine, an associate professor of environmental science at James Cook University in Queensland, specializes in the World Heritage process. 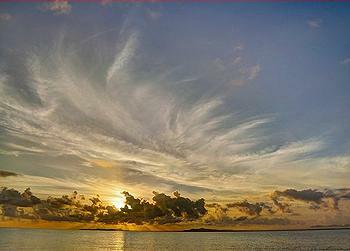 He says Cape York meets many of the World Heritage criteria for listing such as “superlative natural phenomena and areas of exceptional natural beauty” with its “vast area of high integrity diverse ecosystems” and “hundreds of kilometres of undisturbed coastal scenery” among other features. The Cape’s unique species include orchids, grasses, sedges and mangroves, reptiles, amphibians, freshwater fish and butterflies. “The region’s outstanding geological features include the active dune fields of Shelburne Bay and Cape Flattery, the remarkable granite boulder fields of Cape Melville and hundreds of kilometres of undisturbed coastline adjoining the Great Barrier Reef World Heritage Area,” wrote Valentine. international migratory birds,” he wrote. But Australia’s Wilderness Society is warning that resource companies and the Queensland government plan to increase exploitation of Cape York for its deposits of bauxite, an aluminum ore and the main source of aluminum. “The nomination of the Cape’s bauxite landscapes that support stunning tall forests should be especially of concern to companies pushing bauxite developments on the Cape such as Rio Tinto, Cape Alumina, Gulf Alumina, Aust-Pac Capital, Chalco, Rusal and Xstrata,” said the environmental group. Commercial quantities of bauxite were discovered on Aboriginal lands at Weipa in western Cape York in 1955, and Rio Tinto began commercial production in 1964 with 453,365 tonnes of bauxite mined and shipped. 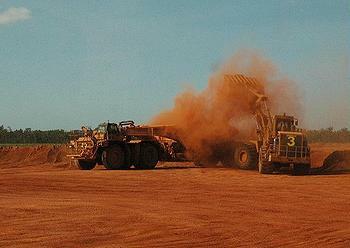 By 2012, Rio Tinto Alcan’s Weipa operations produced 23.3 million tonnes of bauxite. Rio Tinto Alcan says vegetation is recovered from the site before it is mined. After removal of the ore the land is recontoured and re-planted with indigenous vegetation. The company’s long-term aim is to achieve a ratio of land disturbed to land rehabilitated of 1:1. In November 2012, the Queensland Government called for expressions of interest to develop another site, the Aurukun deposit on western Cape York. On April 23, the Queensland Government released a shortlist of five groups to progress to detailed proposals of the Aurukun bauxite resource. World heritage listing brings international recognition and provides protection for the listed cultural and natural heritage values of a place under Australia’s national environmental law—the Environment Protection and Biodiversity Conservation Act 1999 (EPBC Act). activities that are likely to have a significant impact on the listed world heritage values (or other matters of national environmental significance) require referral and approval under the EPBC Act. Australia now has 19 places on the World Heritage List, including: the Wet Tropics of Queensland, the Great Barrier Reef, Purnululu National Park, Lord Howe Island, the Greater Blue Mountains and Kakadu National Park.